We strongly believe that investing in young talent and moulding those individuals into first class engineers, with all the knowledge and experience necessary to do one of the most challenging support roles in the North East, helps build a work force that is loyal, knowledgeable, and customer focused. To create first class engineers, Smart IT have teamed up with technology training provider QA to build a unique apprenticeship scheme that provides all the necessary knowledge and experience required to mould a first class engineer. Ofsted rated QA Apprenticeship schemes ‘Outstanding’ in all areas. Like most apprenticeship schemes, all apprentices earn a range of qualifications and experience that will kick start their career in IT. However, the Smart IT Advanced Apprenticeship scheme is one of the very few that will certify engineers to be Microsoft Certified IT Professionals or MCITP for short. Last year apprentice Anthony Crawford came runner up in the National Apprenticeship Awards after completing his apprenticeship well ahead of time and with excellent results. 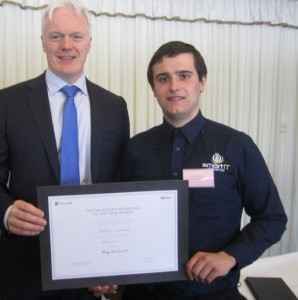 Anthony was invited to the House of Commons in London to meet Michel Van der Bel, Managing Director of Microsoft UK, who congratulated Anthony on his achievements. Anyone interested in enrolling on Smart IT’s Advanced Apprenticeship scheme should register their interest using our Job Alerts feature on this website to be notified as soon as a vacancy arises.